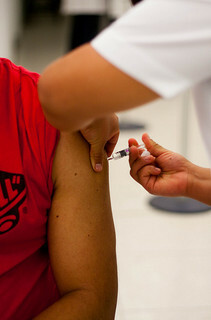 Vaccinations: Are they Worth the Shot? Getting a shot at the doctor was something I always dreaded, and to this very day the thought of getting stuck by a needle in the arm still makes me feel sick to my stomach. I would actually try to hide in the doctor’s office when I was little, just so I could avoid getting vaccinated. Back then, I hated shots, but I understood little about them. All I knew about shots is that they would keep me from getting sick, but other than that, they were horrible, terrible instruments of torture. It was not until recently that I have found a new appreciation for vaccines, and today, now that I’ve looked back on it, I am glad I was vaccinated as a child. Sure, they hurt like the dickens and those three seconds of pain are never fun, but you know what, vaccines are worth the shot (pun intended). There are lots of controversies surrounding vaccines, and I am sure that many people would disagree with me, but hear me out. Without getting too deep in history, vaccines were mainly created to cease the spread of extremely dangerous and potentially fatal diseases. During the 17th century, the average life expectancy of Americans was just about 40 years of age. Why such a low lifespan? Because diseases like rubella, measles, tetanus, and chickenpox would strike early during childhood or infancy and cause death. People knew these illnesses were very contagious and very deadly and were terrified of them. Survivors of these diseases were often left paralyzed, blinded, weak and sickly. Today, we are vaccinated for the measles, mumps, rubella (MMR vaccine) and the chicken pox due to the severity of the diseases and the after-effects that may occur. For example, we know that people who have contracted chicken pox as children have a higher risk of contracting shingles, a painful, blistering skin rash. According to the American Academy of Dermatology (AAD), the shingles virus can remain dormant inside the body after the person recovers from the chicken pox; sometimes it never returns, but sometimes the virus awakens. The only way to make sure the virus stays dormant forever is to be vaccinated. Thanks to modern-day vaccines, century old diseases and viruses have been all but completely eradicated. People now no longer have to fear losing their child early in life because of the flu, mumps or scarlet fever. The life expectancy has improved over the course of time to about 76 years of age because of advanced medicine and technology. However, today, parents are becoming too lenient or perhaps too fearful of vaccines. There have been many scary stories told about people suffering from symptoms caused by vaccinations. The truth is, the risks of living without vaccinations are perhaps more frightening than the symptoms the vaccinations can cause; you are more likely to contract the flu and become deathly ill than get a deadly symptom caused by a vaccination. In addition, what people are not aware of, particularly people who are refusing vaccinations for themselves and for their children, is that these age-old diseases that rarely occurred are now becoming more frequent. Just recently, there was an outbreak of measles in California: more than 58 cases were reported, the highest since the last outbreak of measles in 1996. While some parents are choosing not to vaccinate their children for their own personal reasons, others are relying on other children’s vaccinations to keep their child from contracting an illness. In both cases, however, the child’s life is in danger of contracting and spreading these diseases, because one cannot always assume that everyone is vaccinated. For our own well-being and the well-being of others, I believe it is very important that we take these diseases seriously and be pro-active. There’s a reason why our ancestors were terrified of smallpox, the flu and rubella and were desperate for medicine to prevent these diseases from spreading and taking the lives of those they loved. If it were not for vaccinations, some us may not even be here today. If we do not want to see these dangerous viruses that were once wiped out of history returning, take it seriously and get vaccinated. Those three seconds of pain are worth keeping yourself and those you love from contracting a potentially fatal disease.